For three generations, Creed Noah and his family have lived in, worked in, and welcomed folks to this neck of Idaho’s woods. Their company, Creed Noah Real Estate, is committed to working with the utmost of integrity, communicating honestly, and treating all customers with care and respect. Creed Noah Real Estate annually donates to girls’ education in Africa, youth health and well-being initiatives throughout the United States, and wilderness protection in West Central Idaho. These charitable causes are foundational to their identity. c308 Marketing was tasked with balancing their revenue-based business with the company's philanthropic heart. The new website’s flow makes users aware, without disrupting their first priority — browsing beautiful ranches, lots, and residences. Image sizing, quality, and vibrance are very important to c308’s dev team. We knew there would be a lot of factors we couldn’t control after the site launched, i.e. the client’s camera gear, short turn-around times, the number of admin handling the site, etc. So to ensure that every image looks perfect, the site is smart-wired to format and enhance image uploads. Integration with the MLS platform, as well as our own custom design elements all help contribute to a sense of trust. 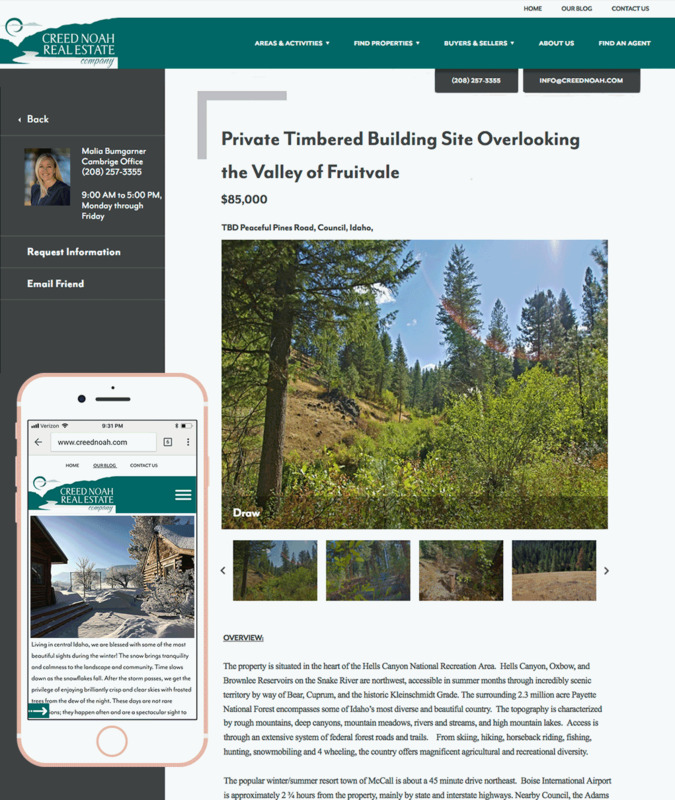 When technology works well and fast, (and when the goods/services look as appealing as Idaho’s backcountry) folks are apt to lose more than a few hours scrolling through galleries of could-be future homes.